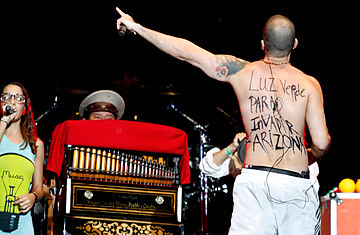 Rene Perez, of the Puerto Rican band Calle 13, performs at the Vive Latino music festival in Mexico City. The words on his back translate as "Green light to invade Arizona"
Divided by a bloody drug war and a harsh recession, Mexico has been temporarily united against an Arizona law that its citizens view as a knife in the gut of their paisanos across the border. At a sweaty Latin American rock festival in Mexico City this week, 60,000 revelers jumped in the air and screamed in unison against the new antiillegal immigrant law. Across the Mexican capital in the grandiose Metropolitan Cathedral, robed clerics railed against the legislation from a gold-covered pulpit. Newspaper editorials, social-networking sites and televised debates joined the outcry. In the Mexican Congress, politicians of all stripes denounced Arizona's Support Our Law Enforcement and Safe Neighborhoods Act as "fascistic," "authoritarian" and "racist." "This is a perverse and inhuman law that generates hate," exclaimed Representative Ruben Moreira of the majority Institutional Revolutionary Party. The disparate voices all agree that the provisions of the measure, which Arizona Governor Jan Brewer signed into law on April 23, will create an apartheid situation in the state when it goes into effect in July. The law instructs local police to demand the papers of anyone with "a reasonable suspicion" of being an illegal immigrant as well as to arrest Americans who stop their cars to pick up day laborers. But despite the uproar, Mexicans were faced, once again, with what they can or will actually do to help their 11 million countrymen toiling in El Norte. President Felipe Calderón promised that his government would throw more than just words at the law. "We are going to act, we are acting and we will act some more," he said on Monday. "Nobody can stand with their arms crossed in the face of decisions that clearly effect our countrymen  in this case, legislation is moving forward that opens the door to unacceptable racial discrimination." Following the statement, his foreign office put out a travel advisory for Arizona, warning that "it must be assumed that every Mexican citizen may be harassed and questioned without cause at any time." However, Calderón did not spell out any other actions he would take, disappointing some activists by stopping short of hitting Arizona with punitive trade measures. Some militants have called for the Mexican government to ban Air America flights from Arizona to Mexico. "Hitting business would really force Arizona to think about what it is doing," said Jorge Mujica, a Mexican-born activist based in Chicago. "But so far, the Mexican government has not committed. It has just talked." Advisers to the Institute for Mexicans Abroad on Tuesday called on citizens to take part in a voluntary boycott of Arizona  urging people to avoid tourism to the state and to avoid buying its products or working with its sports teams. The call was backed by the nation's key business lobbies, including the Business Coordinating Council as well as some influential media personalities. "The law signed by Brewer of Arizona is just like the German Nazi laws that make Jews scared to go out on the streets," wrote journalist and TV presenter Ricardo Rocha. "We have to smash their business agreements in the nose. We have to declare war on Arizona." However, Mujica believes that the most effective pressure will not come from Mexico but from the immigrant-reform movement in the U.S. The colossal 2006 marches in favor of immigration reform created a network that will get people back on the streets in response to the new law, he predicts. "We have a lot more experience and a lot more people now. Back in 2006, it took us several months to organize," he said. "But within 24 hours of the Arizona law, we already had collected 400,000 signatures against it. We are going to protest and boycott and make Arizona realize that this will cost it money."